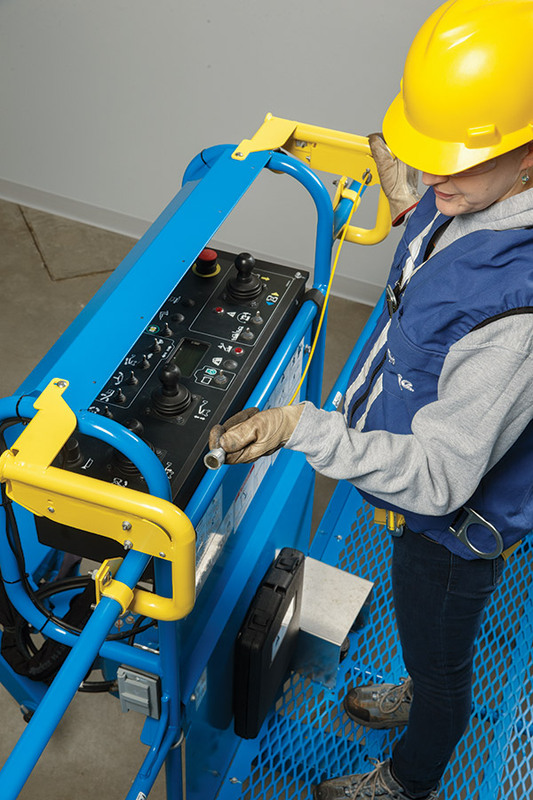 The new Genie® Lift Guard™ Contact Alarm system alerts when an operator disconnects the activation cable located near the platform control panel. Genie protective solutions continue to evolve. Operator safety is a paramount importance for Genie, and we have developed the first in the next generation of innovative accessories with this goal in mind. Introducing the new Genie® Lift Guard Contact Alarm system, a contemporary accessory that can, in some circumstances, provide your rental customers with additional operator protection. Engineered to be an electronic secondary guarding system, Genie designed this new system to activate and immediately alert others that an operator may need help. 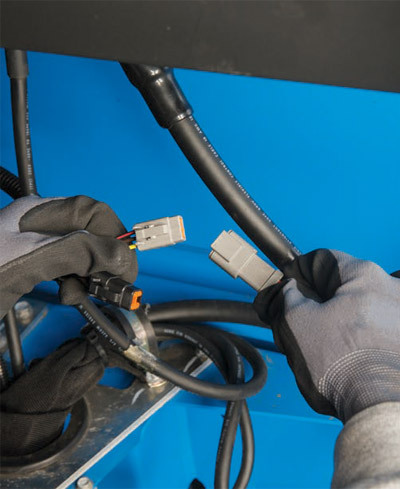 A key feature of the new system is the “free-movement zone” between an activation cable and platform control panel that may allow for operator mobility once the system is activated, to either reset the system or remove themselves from the hazard. 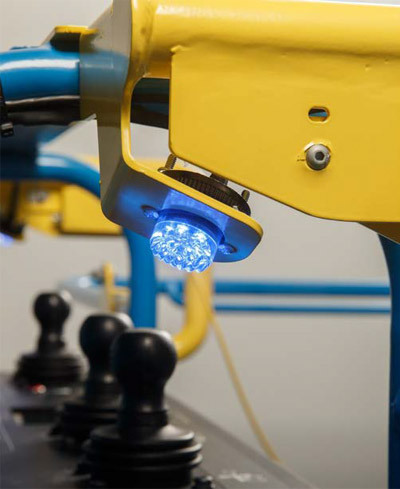 Unlike some other devices on the market, the Genie Lift Guard Contact Alarm system could reduce the risk of operators applying unintentional contact pressure on the boom’s control panel. This new configuration is a standard accessory on most new Genie Z™ (articulated) and S™ (telescopic) boom lifts manufactured in 2017 and moving forward. The new Genie Lift Guard Contact Alarm system features an activation cable fitted between the operator and platform control panel. When pressure is applied to the cable, it disconnects and activates the system. Machine motion is stopped preventing additional movement in the platform. In addition, an alarm sounds and beacons flash, notifying everyone near the Genie boom lift that the operator may require assistance. The system is only functional when the footswitch is depressed, and motion does not resume without human intervention. All notifications and function restrictions will continue until the system is reset by simply clicking the activation cable back into place and removing a foot from the footswitch; there is no need to restart the engine or cycle emergencystop power to resume machine functionality. Ground controls remain active after system activation. We engineered the new Genie Lift Guard Contact Alarm system to be visible from the ground with its bright yellow color. In the platform, it is as unobtrusive for your customers’ operators as possible. It is simple to use, and it is used in conjunction with operator training required by industry standards worldwide that could enhance safe work practices on aerial jobsites. 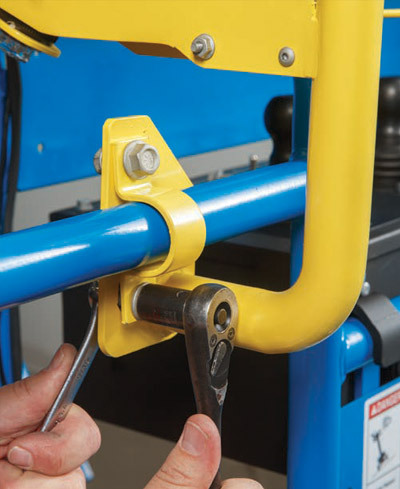 Boasting a robust configuration with simple parts, the Genie Lift Guard Contact Alarm design provides operators with excellent visibility of the control panel and aerial jobsite, not interfering with machine operation. The Genie Lift Guard Contact Alarm system is available installed standard from the factory or as an aftermarket kit, which can easily be installed in less than 30 minutes with only a few fasteners and electrical harness connectors. All Genie genuine parts and accessories, including the new standard Genie Lift Guard Contact Alarm system, are specifically designed and tested for our machines. This means these accessories will fit correctly every time. The new Genie Lift Guard Contact Alarm system fits on most platforms in the Genie Z*- and S-boom families and can be retrofitted on units back to 2003. In addition to this new accessory, Genie also continues to offer its Operator Protective Structure (OPS). Introduced in 2012, the Genie OPS may be attached to boom lifts with 6 ft to 8 ft platforms. The tubular steel structure is designed to transfer the kinetic energy into surrounding structures while maintaining a protected area for the operator in some circumstances. It weighs 16 kg (36 lb) and is bolted directly on the boom lift’s platform — no modifications are needed. * This accessory is not yet available on Genie Z-33/18 articulated boom lifts, GR-26J or Genie TZ-34 and TZ-50 trailer-mounted booms.